Home > Blog > Do scaffold shrink wrap installers deserve more recognition? 06 Feb Do scaffold shrink wrap installers deserve more recognition? I’ve just spent a few days on The Shetland Islands shrink wrapping a scaffolding with two very experienced installers and it reminded me of the skill and hard work needed to get a scaffold shrink wrapped successfully. Ten years or so ago I was ‘on the tools’ quite regularly, but as the business has grown, I’ve spent much more time behind a desk pricing jobs, so I felt a bit apprehensive getting out there. However, after spending nearly a week working with Kris and Danny from Rhino Shrink Wrap I realised that I’d forgotten the skill and effort needed to carry out a scaffold shrink wrapping to a high standard. OK, I admit that basic shrink wrap skills – heat welding two pieces of shrink wrap together to make a join and shrinking the sheet ‘drum tight’ are not exactly ‘rocket science’ – most people can weld and shrink sheeting after some brief instruction. 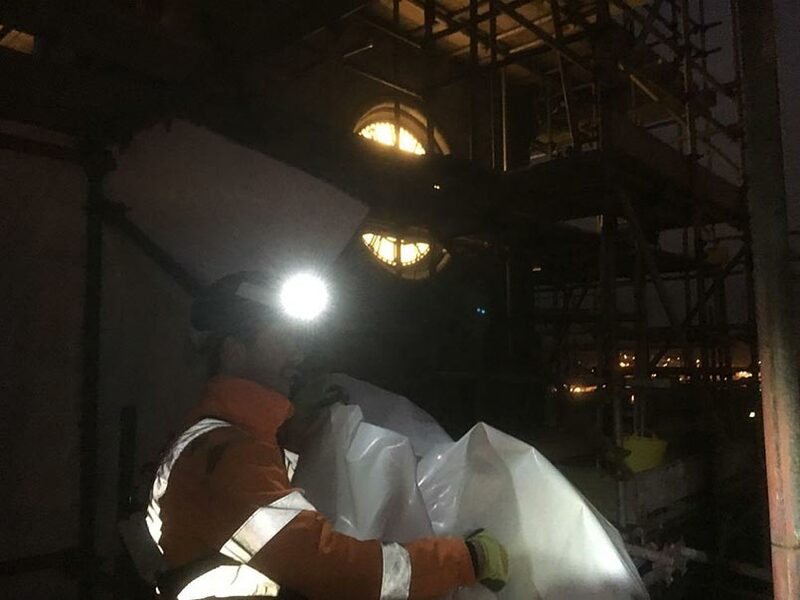 However, putting those skills into practice on a real scaffolding project on a busy construction site is another thing altogether – it’s not just a question of hanging the shrink wrap sheeting and hoping for the best! Here are a few of the things that I ‘re-learnt’(!) from my week at the ‘sharp end’…..
Planning a sequence of work is hard, especially when taking account the constantly changing weather conditions. With ‘traditional’ scaffold sheeting systems such as ‘Monarflex’ 2-3 metre wide strips of sheeting are hung and bungeed around the scaffolding ‘lift by lift’. There is not much variability to the installation process and so it doesn’t require a great amount of thought or planning. With shrink wrap, there are so many more ways it can be installed depending on the requirements of the customer – Is this for temporary weather protection or complete encapsulation & containment? Shall we drop the sheeting 1,2 or 3 scaffold lifts? Shall we just cap the roof & sheet the sides separately or do we cover the roof and come down the sides in one go? Which way can I hang this 7m x 15m roll to avoid wasting materials or creating lots unnecessary welds and joins? With most projects you need to plan ahead but with shrink wrap sheeting it is a much more ‘dynamic’ situation – with the changing weather affecting plans – If the wind is forecast to increase later from the South lets hang these larger sheets on this side of the building now, and we’ll move on to the smaller sections on the sheltered side of the building later on…. It’s not just hanging the sheets of course. When the winds are light, or when shrink wrapping indoors, shrink wrapping is straightforward. One sheet can be left clipped in place whilst the next is worked on. However, when the wind rises, the skills of the installer are demonstrated. In particular, heat shrinking becomes a delicate technique – gradually heating the sheet bit by bit in small areas, and so starting the shrink process, but not heating the sheeting so much that the wind blows the sheeting out into a bubble, (sometimes known as ‘spot shrinking’) is a delicate skill. In an ideal world, the scaffold structure will be square & flush. In the real world, however, things are a little more challenging; there are protruding transoms, handrails or boards, awkward shapes and ‘add ons’ such as towers, roofs and canopies. Planning the installation of sheeting around these complications, to complete a job rapidly and without waste – and keeping it looking tidy can be hard and experience really makes a difference. And all of these challenges are set against travelling between sites, early starts and late finishes, pressures from clients to complete as rapidly as possible, often on large, high profile construction sites with multiple trades working alongside. Just getting the shrink wrap, gas cylinders and equipment to the work face – hauling up ladders, crouching under low lifts, squeezing past internal braces can be difficult. Despite this, the installers remain upbeat and professional and take great pride in their work. And it’s not just our teams. Over the past 20 years I’ve seen the world of scaffold shrink wrap grow and grow. I estimate that there are probably 75-100 ‘specialist’ shrink wrappers employed day to day in the UK but there are many more, perhaps 500-1000 occasional wrappers, mostly scaffolders who have been trained in the shrink wrap installation process by Rhino and others. After a week of starting & finishing work in darkness, battling the weather and hauling materials and equipment all over scaffolding I appreciate getting behind the desk again. However, I’ve been left with a feeling that it might be time that the skills of hard working installers of shrink wrap sheeting were recognised as an official ‘trade’. What do you think? Maybe get in touch and let me know your thoughts. Perhaps we can make this happen…..